There are three sections in this book. The first is Designing with Perennials which gives us 135 pages of which plant to put where and why. Countless lists of what grows in the shade, blooms at night, are native, attract birds, go to together and more are provided in this section. The second section is 126 pages of Perennial Garden Basics. This is a how to gardening section that includes site location and preparation, soil requirements, planting, pruning and caring for the plants. The third section is the encyclopedia itself. 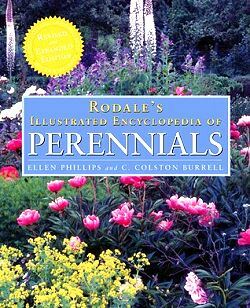 In the true Rodale fashion each plant in the encyclopedia section gives us information on the specifics that are culturally required to be successful with that plant. Having so much information in one place is handy for sorting out what will be appropriate in your garden.